What are Collectable Monster Miniatures / Tokens? Monster tokens are alternatives to 28 mm table top miniatures. We still use table top miniatures in our games for player characters and some NPCs but for the most part monster tokens are just too convenient not to use. Because they are so cool they have become highly collectable. Inexpensive. You get 4-5 stunning tokens for the price of a single unpainted or junk painted miniature. They can be numbered or lettered to help avoid confusion. They can be written on with dry erase markers and they wipe completely clean like there was never a mark on them. They don't block the map or other tokens on the table. They don't fall over and are easy to move about the board. They are easy to store, organize and find on demand, especially, if stored in top loading collector card binder pages. We have multiple hand picked artists so you can choose tokens based on a particular style or artist. MOST IMPORTANTLY, Each of our tokens is a work of art, whereas, the miniature sculpts are good but a pre-painted paint job is almost always of poor quality. Multiple sizes 1/2", 1", 2" and 3" tokens. You can adjust the size of the token. Tiny to small, huge to large, etc. Choose the size that works best for your game system. You want a Huge 3" Owl Bear? You can have one. You can number the tokens in sequential order. Put letters on tokens instead of numbers. Click here to see all of the customizations currently available. Which would you rather have? A cool token or a pre-painted miniature? You be the judge. 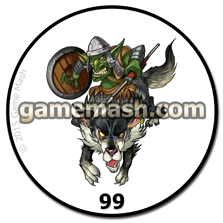 Beautifully illustrated Goblin Wolf Rider monster token. 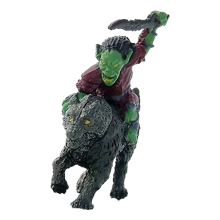 Pre-painted goblin wolf rider miniature.